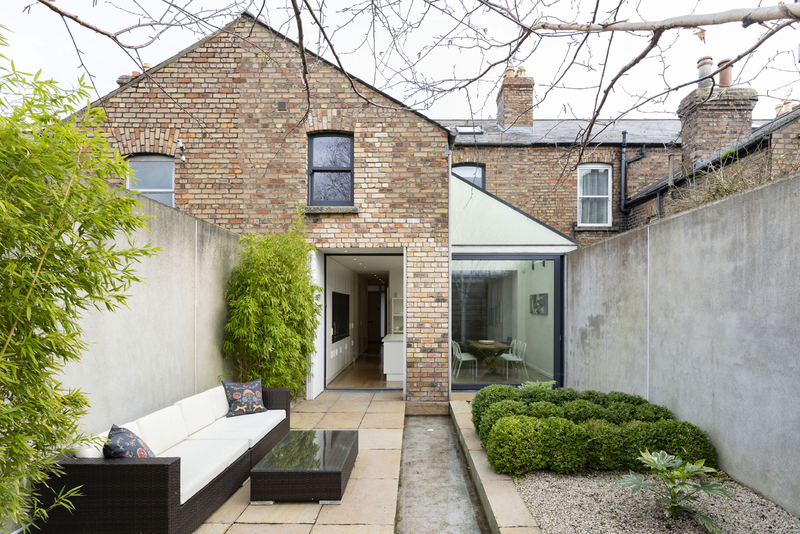 A wonderful opportunity to acquire a very fine, contemporary, period property which is in walk-in condition throughout. 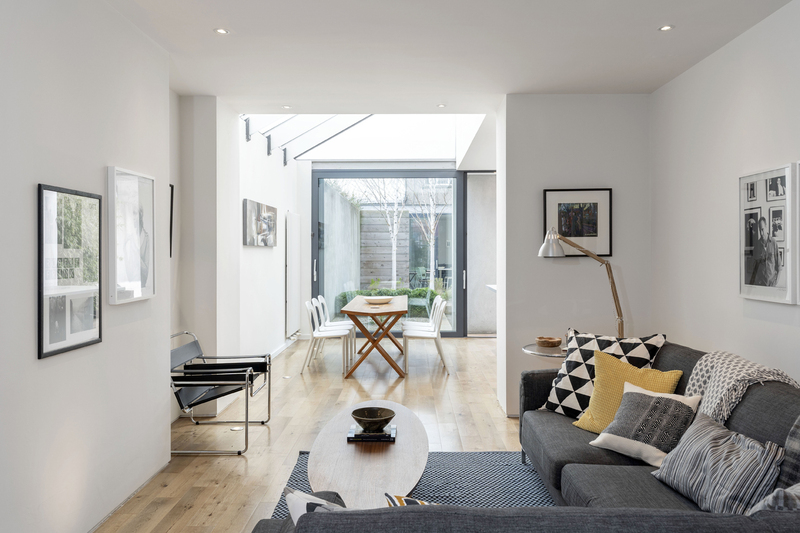 It was refurbished and extended by architect Mark Guard of Guard Tillman Pollock, London in 2009/10 and now offers a contemporary, minimalist space which fulfils the owners brief to the architect of a “a modern, comfortable and dramatic living space”. The design has stood the test of time and the contemporary feel in the traditional setting complement each other. Coming through the front door to the hall you can see right through the house out to the garden beyond. There are engineered oak floors throughout. A downstairs WC and storage are under the stairs with the rest of the downstairs being open plan. To the front is the living area and study area. 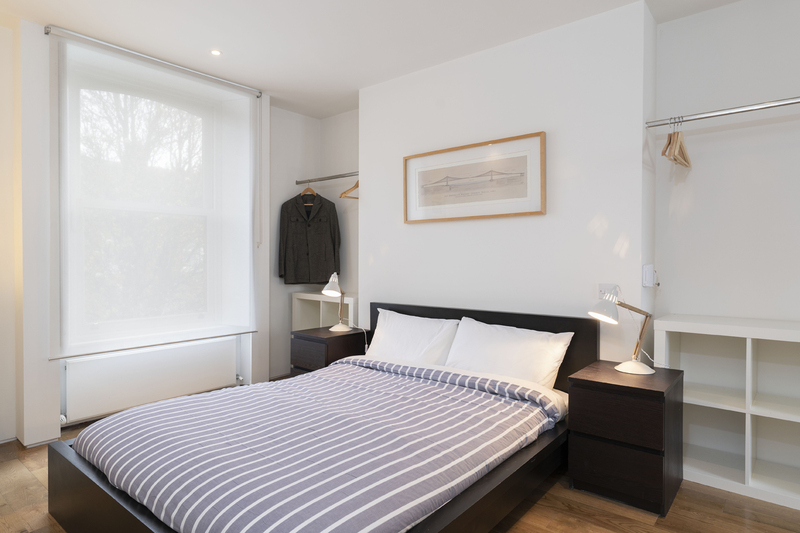 There is recessed and floor lighting, bespoke window shutters and built in shelving and storage. 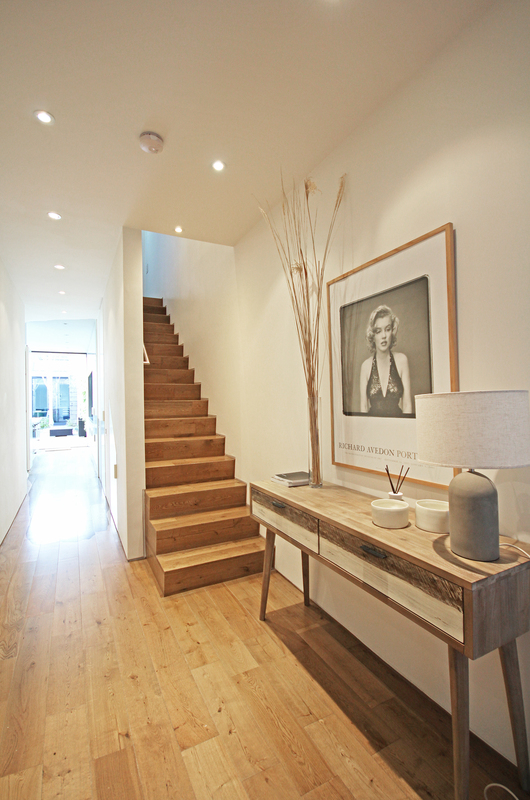 This leads through to the dining area and kitchen. 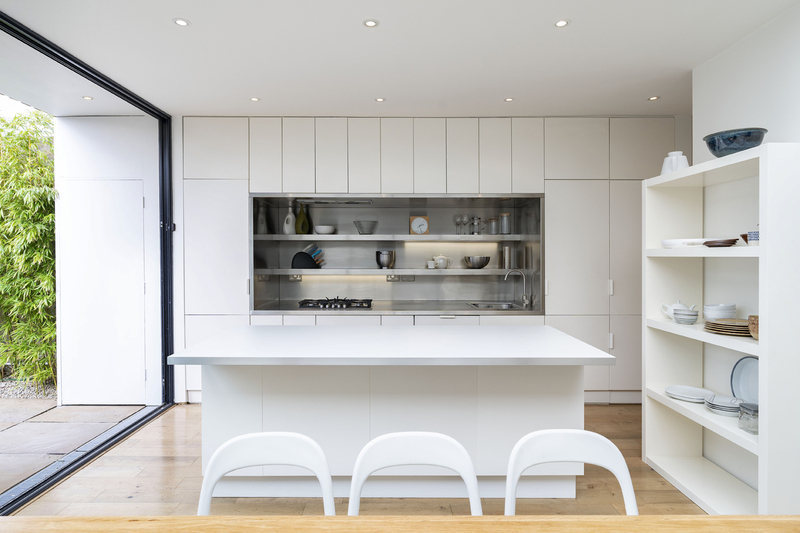 The kitchen has bespoke fitted units with a stainless steel worktop and shelving. 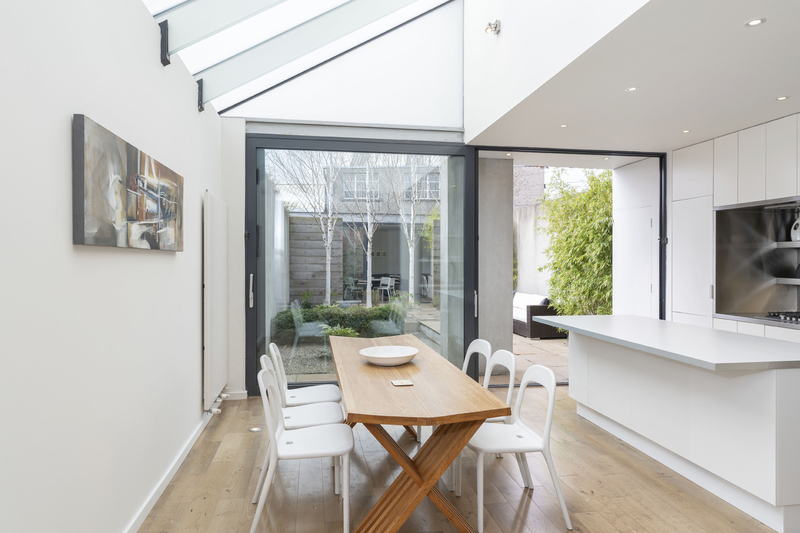 The dining area is complemented by a vaulted ceiling with glass beams and glazed panels. There are ‘Schuco’wall to wall, floor to ceiling glazed sliding doors which open up the space to the landscaped garden beyond. They are mirrored in the garden studio at the end of the garden. 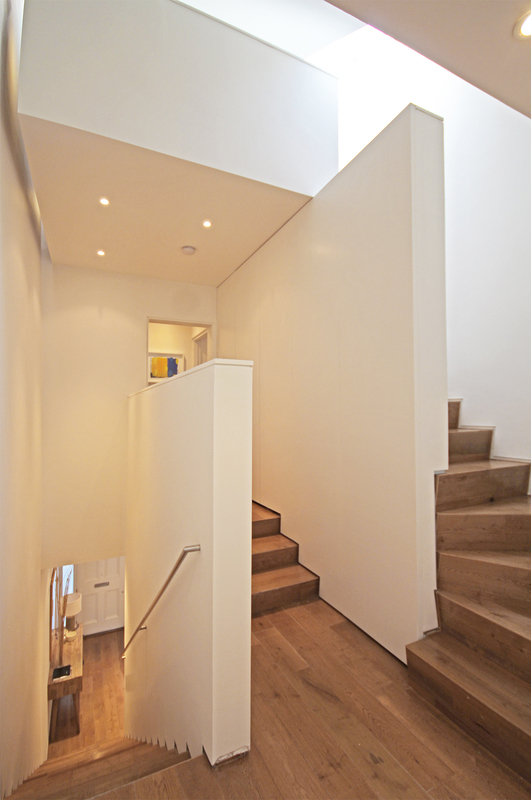 Upstairs the minimalist design continues with clever lighting and cupboards concealing the utility area. 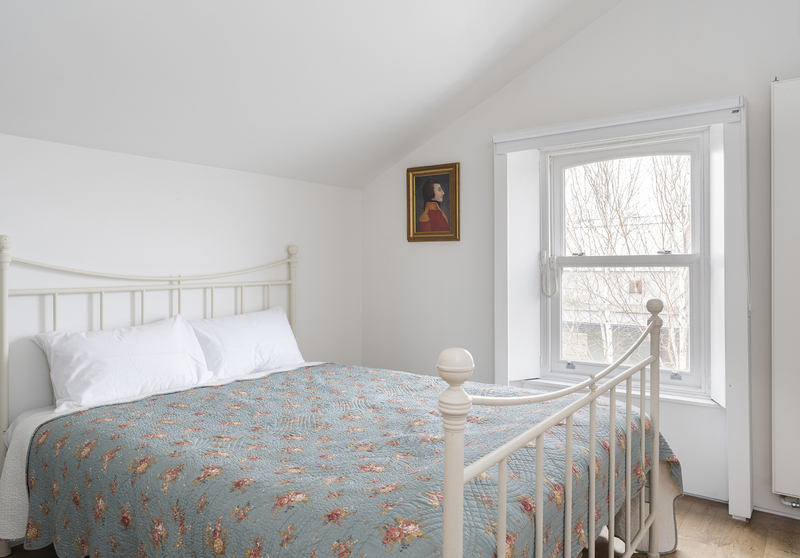 There are three double bedrooms, two of which are ensuite. The master bedroom has a well appointed ensuite with bath and separate curved shower enclosure. This design is echoed in the second bedrooms ensuite too. Upstairs the attic has been converted to give c. 197sq ft of extra space. 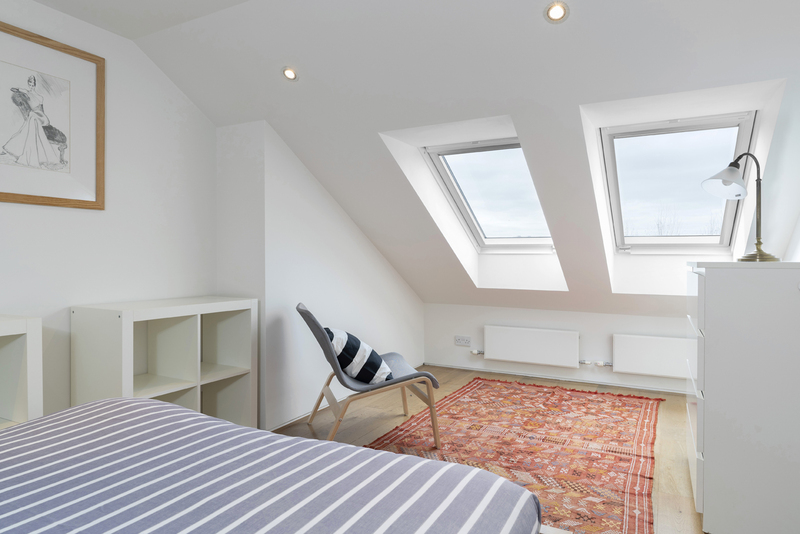 There is an office area, shower room and attic room which is currently used as a bedroom on the floor. Outside there is a wonderful, west facing, landscaped garden which is low maintenance and offers plenty of privacy with high boundary walls. At the end of the garden there is a garden studio which is designed in the same theme as the main house. The ‘Schuco’glazed sliding doors mirror those in the main house. 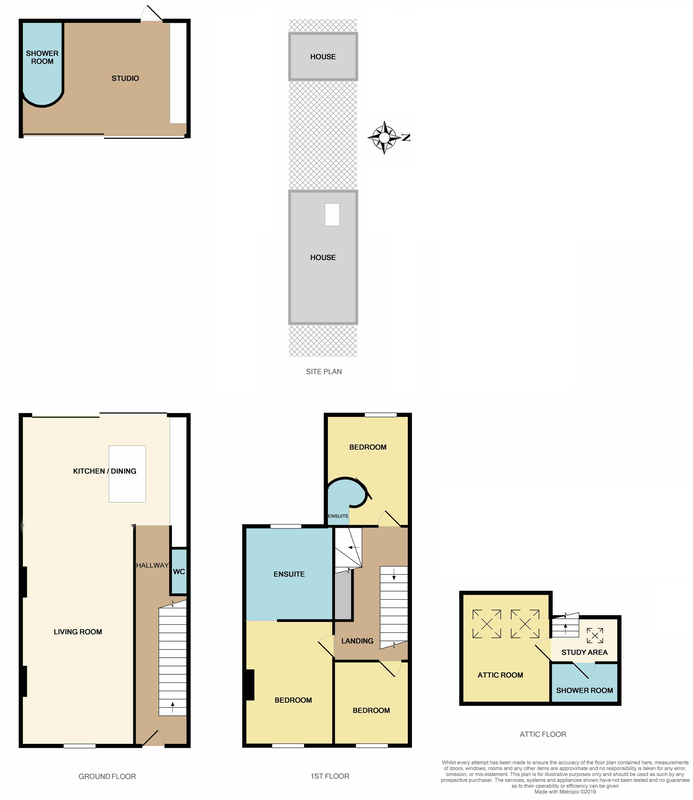 With c. 243sq ft of space it there are plenty of possibilities for the new owner. This exits out onto a laneway which leads to Wolseley Street. 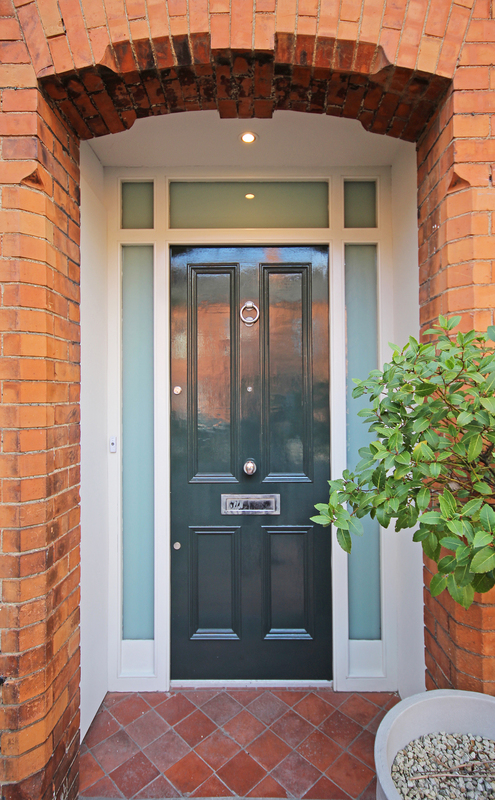 The location is quiet yet highly convenient to St Stephen’s Green and Grafton Street which are just a 10 minute stroll away. The immediate area has wonderful local shops, delis and restaurants while the local street vendors on neighbouring Camden Street offer daily fresh fruit, veg and flowers. 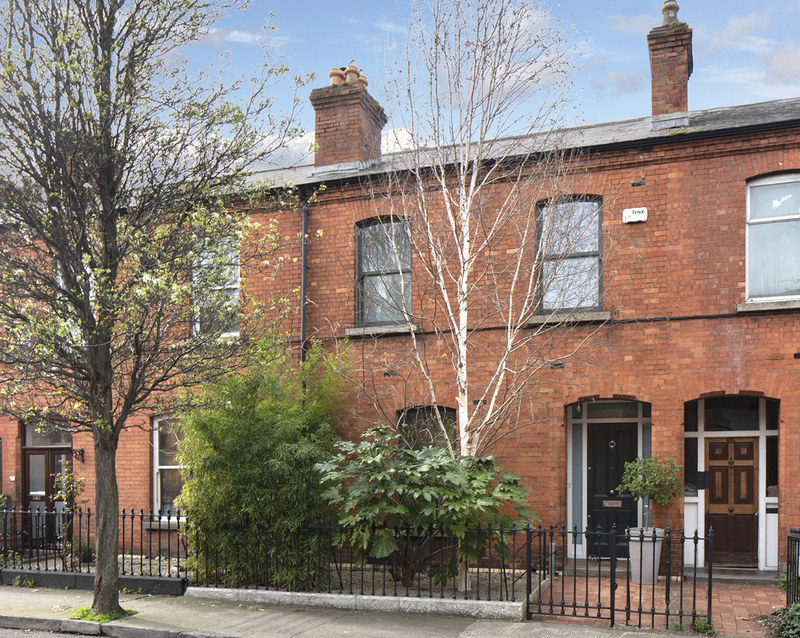 Harcourt Street Luas stop is but a 10 minute walk away while prime bus routes run along South Circular Road ensuring quick and easy access throughout Dublin and its environs. Oak floors. Understairs storage. Recessed lighting. Alarm panel. Oak floors. WC. Wash hand basin. Extractor fan. Oak floor. Recessed lighting. Floor lights. Built in shelving and storage. TV point. Wooden window shutters. Oak floor. Bespoke fitted kitchen with stainless steel worktop and shelving. Larder. Integrated Smeg dishwasher. Integrated freezer. Integrated fridge. Electric oven. Five ring gas hob. Extractor fan. 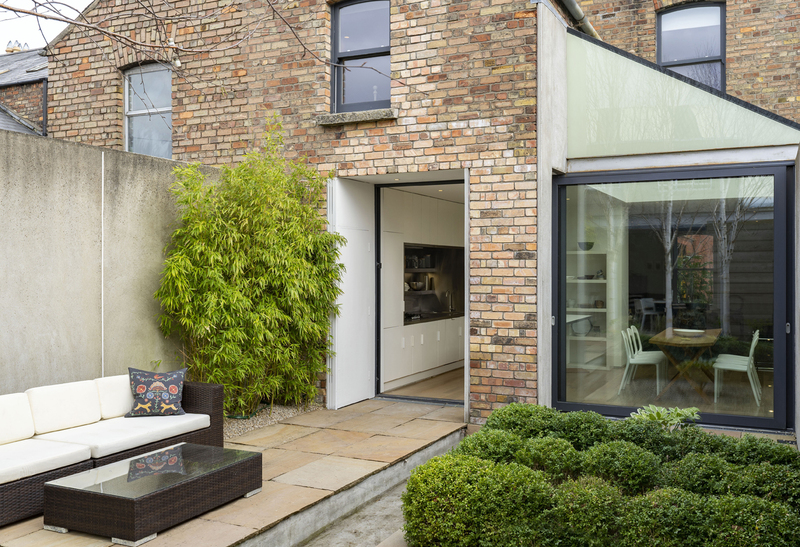 Schuco glass sliding door to garden. 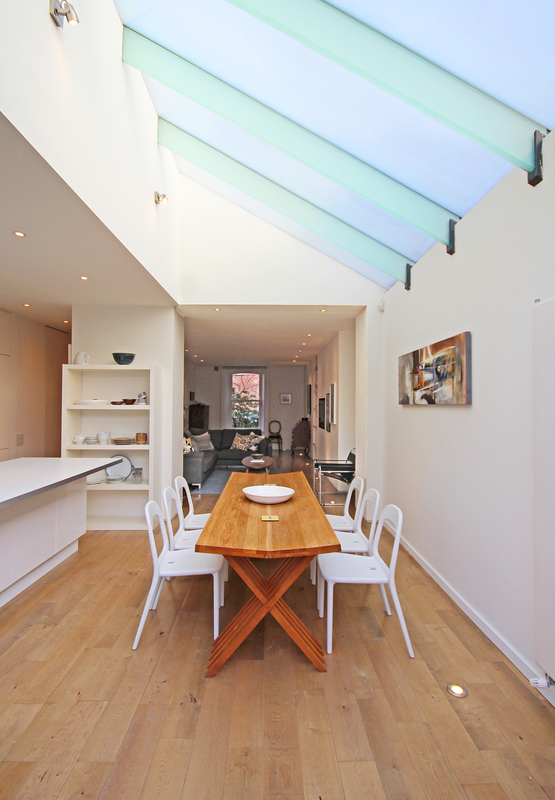 Vaulted ceiling in dining area with glazed roof and glass beams. Oak floor. Recessed lighting. Storage with immersion and plumbed for washing machine and dryer. Roof light. Oak floor. Alarm panel. Bespoke window shutters. Recessed lighting. Oak floor. Double ended bath. 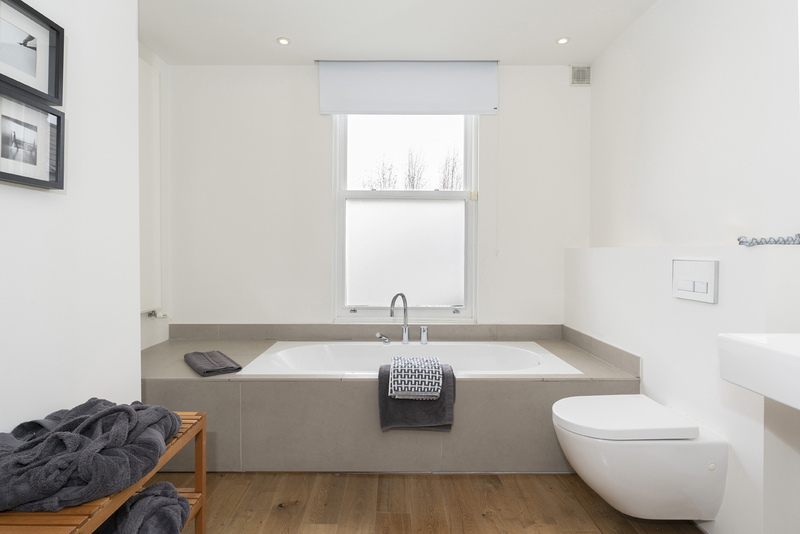 Duravit WC and wash hand basin Recessed lighting. Feature curved shower enclosure with rain effect shower. Extractor fan. Oak floor. Wall mounted lighting. TV and phone point. Bespoke wooden shutters. Tiled ensuite with WC. Feature curved shower enclosure. Duravit wash hand basin. Extractor fan. Oak floor. TV and phone point. Oak floor. TV and phone point. 2 Velux windows. Tiled floor. Duravit wash hand basin. Villeroy and Boch WC. Large shower enclosure. Extractor fan. Recessed lighting. Oak floor. 2 x Velux windows. TV point. Eaves storage. Recess lighting. 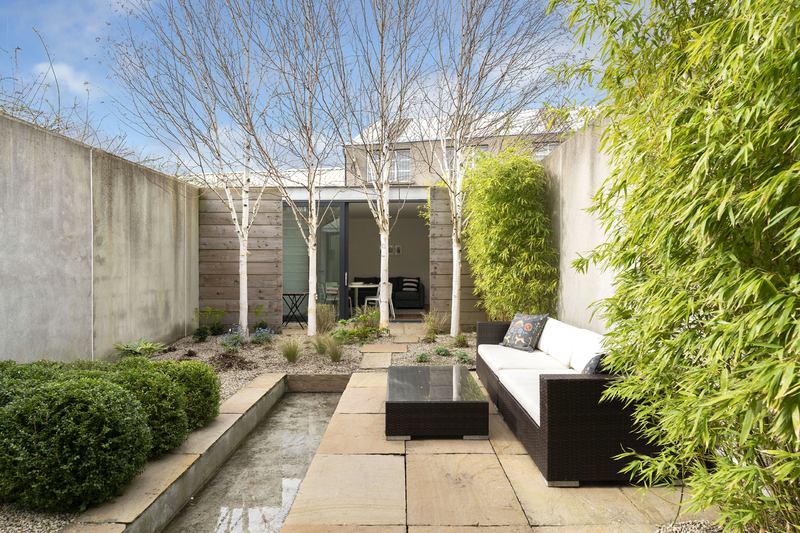 Landscaped west facing garden with sandstone paving. Gravel. Silver Birch trees. Water feature. Bamboo and shrubbery. Tall walls and wood panelling. Private and not overlooked. Gas boiler. Oak floor. Fully fitted floor and wall kitchen units. Recessed lighting. Floor lights. Shuco sliding glass door. Bathroom with tiled floor. WC. Wash hand basin. Circular shower enclosure. Extractor fan. Gravelled. Storage. Gate to laneway. Small railed garden to the front. On street residents disc parking.